The meeting of Bank of Japan left a negative impact on JPY and on the other hand, the US will release some economic data such as Personal Spending m/m, the Core PCE Price Index m/m, the Goods Trade Balance and Pending Home Sales m/m, however, USDJPY will be less volatile today. 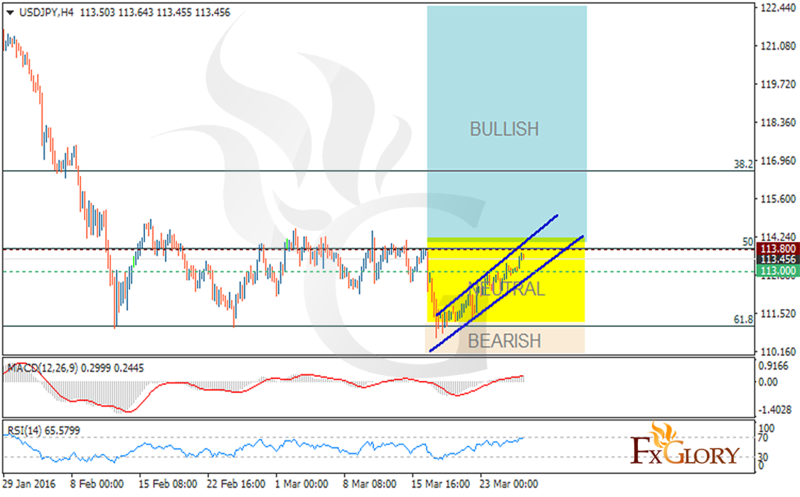 The support resides at 113.00 with resistance at 113.80 near the 50% retracement of Fibonacci level. The price has been moving around the neutral zone since first days of February and now USDJPY is expected to have a bullish trend. The MACD indicator is in positive territory showing the price consolidation and the RSI indicator is also confirming the price growth. Buyers can target the resistance level breakout at 113.80 but in terms of the downtrend movement the support may reach 112.00.